A Bournemouth fundraiser for Cancer Research has tied herself up in a town centre shop as part of a campaign to support people suffering from cancer. 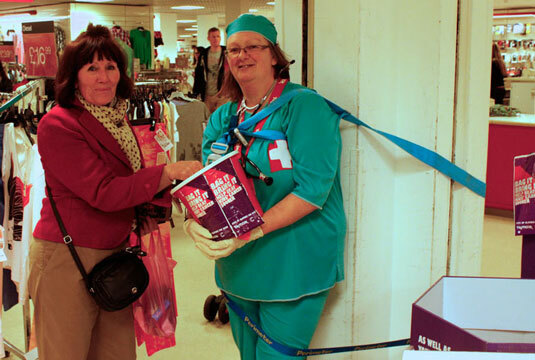 Pauline Teal, 53, of Bearwood, ties herself up every week in the store where she works, TK Maxx in Old Christchurch Road. Mrs Teal, who works as a retail assistant, raised £170 in three hours. A fundraising campaign with a charity box averages no more than £15 for the same duration, according to the store’s manager. She is calling on fundraisers across the UK to dress up differently in order to get attention to help people in need.